At Sonitrol your needs are our highest priority. Our systems are custom designed to meet your specific needs. Our customers stay with us for decades because of our efficient detection systems and excellent customer service. Other companies using non-verified security alarms rely on easily compromised technology, such as motion sensors and door contacts. These older, less effective systems have a remarkable 98-percent false alarm rate. 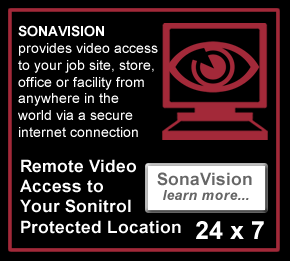 What we have is a unique verified AUDIO AND VIDEO System - Therefore Sonitrol operators can actually hear and see what is going on before criminals actually enter. Our operators do this through our verified audio and video monitoring programs. Once an alarm is detected, Sonitrol verifies the source of the alarm and either resets it or sends in the law enforcement. When our system identifies a problem at your facility, our operators can determine the nature of the disturbance and either reset the alarm or contact the police immediately. 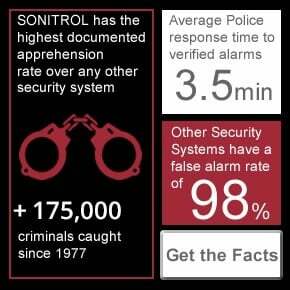 And because Sonitrol systems are verified, our average police response time in North America is 3.5 minutes. Other alarm companies detect an intrusion after the criminals are already inside your premises, if at all. Their monitoring operator - who may be managing as many as 15,000 systems simultaneously - sees a red light indicating a problem at your facility, and then calls your business to see if anyone will answer the phone. Most criminals will not answer your telephone. The monitoring station then calls you to ask what you think they should do next. At this point you must decide if you want to risk the 'False Alarm' fine, or drive down to the store or warehouse in the wee hours to see if there is a burglary in progress.